The Israelis were not satisfied with the mere occupation of Palestine, the evictions of hundreds of thousands of Palestinians out of their country, the annihilation of Gaza Palestinians through a choking economic siege and frequent aerial bombardments, and the continuous confiscations of Palestinian land and the demolitions of their homes in the West Bank, so they had developed a very oppressive anti-Palestinian children policies, that are aimed at intimidating, terrorizing and traumatizing Palestinian children, whose families dared to stay in the country. These policies, that seem to be part and parcel of the racist expansionist ideology of the state of Israel and of its army, aim primarily at driving Palestinian families out of the country for the sake of their children's future, and secondary to traumatize and terrorize Palestinian children while very young so that they would not dare grow up into revolting young men. A similar tactic is adopted in East Jerusalem. The Israeli government want to put its hands on Silwan; a Palestinian neighborhood adjacent to the Al-Aqsa Mosque, in order to build what Israeli officials call “King's Garden”. Palestinian homes in this neighborhood are being confiscated, their owners being evicted, and Israeli extremists moving in. At times Israeli extremists force their way into one room of the house and start harassing the Palestinian family owner. An Israeli settlement is being gradually built in the neighborhood. Such settlements in East Jerusalem constitute a violation of international law. These extremist settlers create tension and lead to constant confrontation and violent clashes . Israeli soldiers use these clashes as an excuse to raid Palestinian homes in the middle of the night, pull their children out of their beds, shackle and hood them, and literally drag them to police stations to be interrogated violently and abusively. 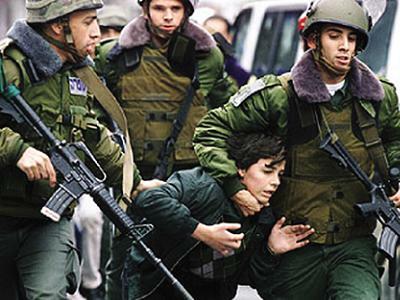 An investigation conducted by the Israeli B'Tselem organization shows that within one year at least 81 Palestinian children from Silwan were arrested and tortured by Israeli Special Forces. A routine operation of the Israeli military forces in the occupied West Bank is called “Straw Widow” . This includes midnight or pre-dawn heavily armed raids on Palestinian homes, breaking down the doors, screaming and shouting at family members, detaining all family members including children in one room, and use the home as a military post for as long as they deem necessary, then leave the home fully trashed. Family members, especially children, feel terrorized, traumatized and severely vulnerable. These traumatic abuses have a great impact on the child's mental and psychological health and produce varying abnormal symptoms depending on the child's age, the type of abuse subjected to, and the family support he receives after his release. The abuse does not impact only the children, but also their families. The families feel helpless, vulnerable, and unable to protect their children. They feel lonely without any legal or psychological help from any social or governmental organization. With their budget under the control of Israeli government the Palestinian Authority is broke and could hardly afford to pay its own essential employees let alone provide any legal or social services to its citizens. Israel's abuse of Palestinian children had become so dramatic a phenomenon that it attracted the attention of nine eminent English lawyers, who were led by Sir Stephen Sadley, a former judge of the highest British court, to visit Israeli courts to study their practices. The lawyers, then, published their findings in a report titled “Children in Military Custody” , in which they accuse Israel of grave violations of the UN Convention on the Rights of Children that include violation of article 2; discrimination, article 3; child's best interests, article 37 (B); premature resort to detention, (C); non-separation from adult family members, and (D); prompt access to lawyers, and article 40; use of shackles. The Israeli arrest, detention and interrogation practices are in violation of paragraphs 36 and 37, and article 37(A) in the prohibition of cruel, inhumane or degrading treatment. Transporting a child prisoner from the occupied territories into Israel is in violation of article 76 of the Fourth Geneva Convention. The failure to provide translated military orders and alleged confession statements from Hebrew to Arabic is a violation of article 65 of the Fourth Geneva Convention. The self-proclaimed humanitarian American administration and NATO, who carry the banners of “Obligation to Protect Lives” and “Providing Humanitarian Aid”, are ready to spare no financial funds and military hardware to attack and destroy countries in Africa, South East Asia, and the Middle East in order to affect a regime change, yet when it comes to protecting Palestinian lives from illegal Israeli occupation turn blind eye to the Israeli massacres, terror, annihilation, and grave violations of international laws and basic humanitarian principles. Sarcastically the American administration does not spare any of its tax payers' money and military aid for Israel despite the fact that Israel refuses to abide by American restrictions not to use these weapons for aggression. Such generous American gifts allow Israel to continue its annihilation of Palestinians and its aggression against neighboring Arab countries. The American administration is giving Israel $30 billion of its critically internally-needed tax money for military assistance without having Israel abide by any humanitarian principles, international laws or standard of basic human decency. “Israel is killing Palestinian children with American tax money” Dennis Kucinich blasted in the deaf Congress.